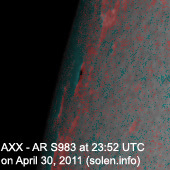 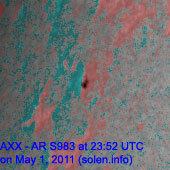 Last major update issued on May 2, 2011 at 05:10 UTC. 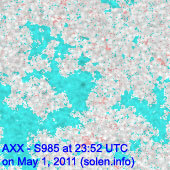 The geomagnetic field was unsettled to active on May 1. 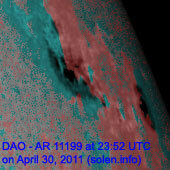 Solar wind speed ranged between 566 and 686 km/s under the influence of a high speed stream from CH446. 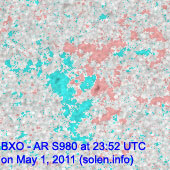 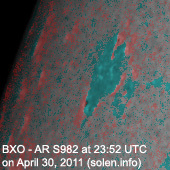 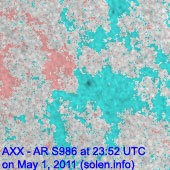 Solar flux measured at 20h UTC on 2.8 GHz was 106.1 (decreasing 6.6 over the last solar rotation). 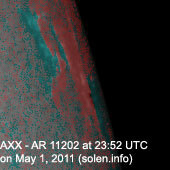 The planetary A index was 19 (STAR Ap - based on the mean of three hour interval ap indices: 19.4). 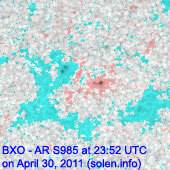 Three hour interval K indices: 33334433 (planetary), 34344422 (Boulder). 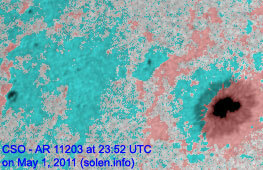 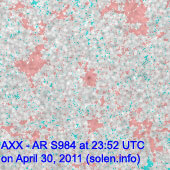 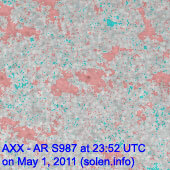 At midnight UTC the visible solar disk had 12 spotted regions. 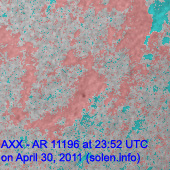 Region 11195 rotated out of view at the southwest limb. 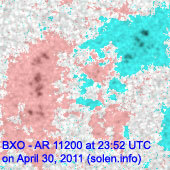 Flare: long duration C1.6 event peaking at 08:14 UTC. 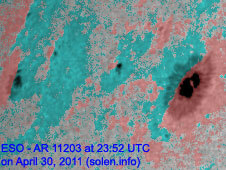 Region 11199 rotated partly out of view at the northwest limb. 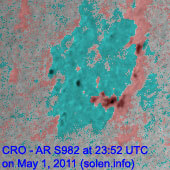 Flare: C6.5 at 23:32 UTC. 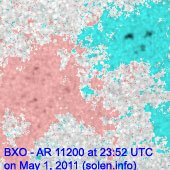 Region 11200 was quiet and stable. 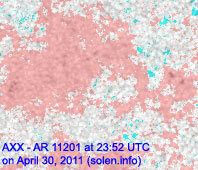 Region 11201 was quiet and stable. 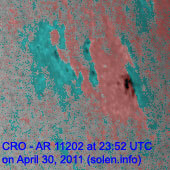 Region 11202 rotated to the northwest limb. 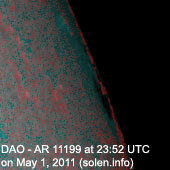 Region 11203 decayed slowly and quietly. 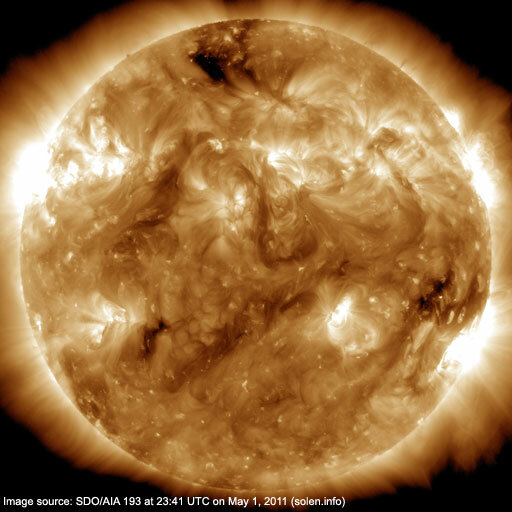 A trans equatorial coronal hole (CH446) was in an Earth facing position on April 26-28. 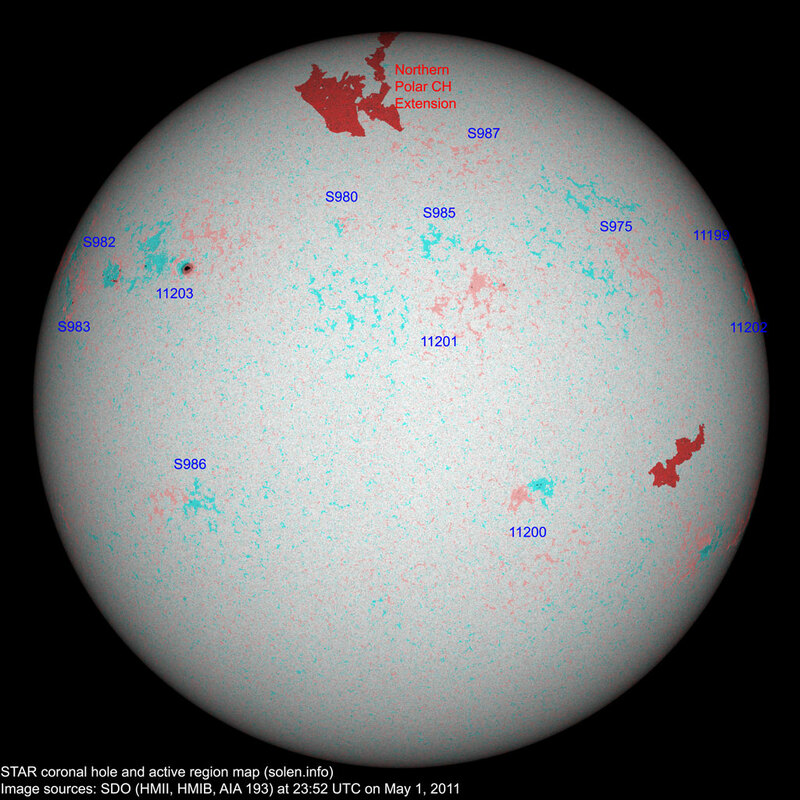 The geomagnetic field is expected to be quiet to active on May 2 and quiet to unsettled on May 3 due to effects from CH446. 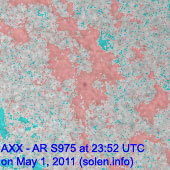 Quiet conditions are likely on May 4.